Now that Superman has been cast, the search is on to find the leading lady for the upcoming film. Spoiler alert, though: The main female character in the movie will not be Lois Lane. Zack Snyder's Superman movie reboot seems to be picking up steam. The script by David Goyer is done, the Man of Steel himself has been cast, and now some major actresses are being considered for the lead female role. However, early reports are claiming that the role is not that of Lois Lane. According to Variety, actresses Alice Eve, Rosamund Pike, and Diane Kruger are the frontrunners for the role. All three of these women have some major roles under their belts. Eve was the main romantic interest in She's Out Of My League. Pike was one of the Bond girls in Die Another Day, as well as a leading character in both Surrogates and Pride & Prejudice. Kruger, in turn, was in both National Treasure movies and played Helen in Troy. Variety reports that the female role hasn't actually been identified yet, "but it's not Lois Lane." According to io9 "Lois isn't in the film at all, because it takes place before Clark Kent goes to work at the Daily Planet." OK, fair enough. 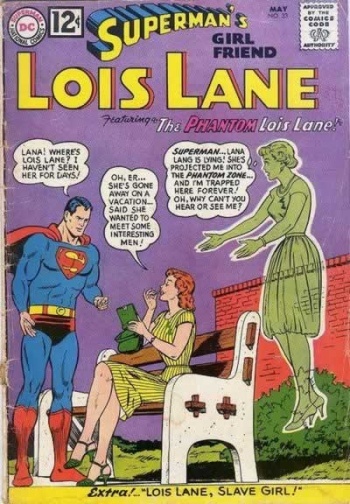 If Clark Kent doesn't get to the Daily Planet yet, I can understand why Lois wouldn't be in the film. Presumably, then, the love interest will be Lana Lang, but I'm holding out hope that things will take a turn for the weird and Superman ends up falling for Lori Lemaris.